Photograph shows the found genera of zooplanktons in ponds of Rajshahi University campus. Pond is a unique environment which is created by man. It must be managed properly to achieve good fish production. Organic and inorganic fertilizers are primarily used to increase populations of aquatic invertebrates such as worms, crustaceans and insect larvae, as well as zooplankton. “Zooplankton” is a very popular term used in fisheries, limnology and ecology. The term “Plankton” for microscopic, infinitesimal animals, first coined in 1887 by Victor Henson at the University of Kiel, Germany is derived from the Greek word “Planktos” meaning “drifter”. He used the name plankton to describe the tiny organism that live suspended in the sea (and in bodies of freshwater) and are important because particularly all animal life in the sea is dependent on them, directly or indirectly. According to Gorell (2006), plankton is the “aggregate of passively floating, drifting, or somewhat motile organisms occurring in a body of water, primarily comprising microscopic algae and protozoa,” and zooplankton is the “animal constituent of plankton; mainly small crustaceans and fish larvae”. According to Islam (1999) “zooplankton is the assemblage of various microscopic or non-microscopic invisible aquatic animals which do not have locomotory power, depend on water current for their movement or those that have feeble locomotory power but not against the water current.” Zooplankton forms the principal source of food for fish within the water body. It also plays a very important role in the food chain as they are in the second trophic level as primary consumer and also as contributors to the next trophic level. In a pond zooplankton production is considered very important for the development of fertilizer based rural aquaculture practice in Bangladesh. An investigation was carried out from September’04 to February’05 in two different waterbodies within Rajshahi university campus to study the changes in the abundance of zooplankton in relation to physico-chemical parameters with an emphasis to record the existing management practices operated by the owners of the waterbody. The water body-1 is situated in between Begum Rokeya and Taposhi Rabeya hall which has an area of 297 dec. with an average depth of 8 feet. This pond receives different inputs (quick fume, sumithion, lime, cowdung, urea, TSP, weatflour and mustard oilcake) during pre-stocking and post-stocking management. The pond is stocked with Rohu (Labeo rohita), Catla (Catla catla), Mrigal (Cirrhinus mrigala), Silver carp (Hypophthalmicthys molitrix), Bighead carp (Aristichthys nobilis), Grass carp (Ctenopharyngodon idella) and Sarpunti (Puntius gonionotus). The water body-2 is situated behind the 3rd science building. It has an area of 100 deci. with an average depth of 3 feet. No significant inputs are applied in this pond but fingerlings are stocked every year. Details physico-chemical properties and pond management activities are given in table1 and 2. 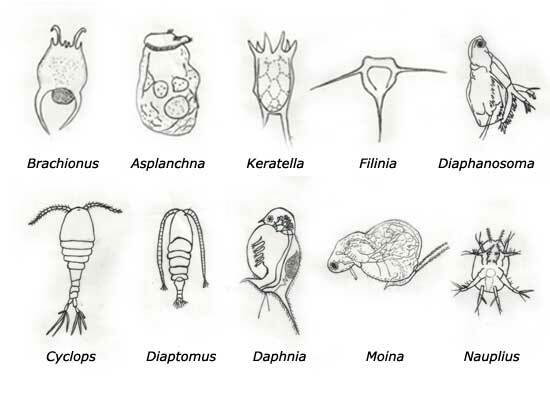 The recorded zooplanktonic organisms were rotifers, copepods, cladocerans and crustacean larvae. There was marked difference in the density of total zooplankton in the two waterbodies. Minimum number of zooplankton was 3320 units/l in September and maximum 6000 units/l in January in water body-1 whereas minimum (1820 units/l) in October and November and maximum (2960 units/l) in January was recorded in water body-2. Copepods were the most dominant group which contributed an average density of 1260 units/l and 973.33 units/l in water body-1 and water body-2 respectively. Rotifers were second dominant, next was cladocerans and lastly crustacean larvae. A total of nine genera of zooplankton were identified of which Cyclops (average density 860 units/l and 586.67 units/l in watrerbody-1 and waterbody-2 respectively) were most abundant in both ponds. Total zooplankton showed positive correlation with pH, carbonate alkalinity (CO3), bicarbonate alkalinity (HCO3) in both waterbodies while DO and carbondioxide (CO2) in the water body-1. Table-3 shows the zooplankton abundance in the studied pond. Present findings indicated that the water body-1 showed better result than that of water body-2 regarding zooplankton production. So, proper management practice can enhance natural food production eventually increase fish production. Gorell, F. 2006. Zooplankton Defined. Archives of Spotlight Feature Articles. Islam, A. 1999. Pholito MatshyoBijnan (In Bengali). Bangla Academy Dhaka 1000, Bangladesh. Visited 5,462 times, 5 visits today | Have any fisheries relevant question?